Made for Chefs by Chefs, Knorr Chicken Flavoured Seasoning gives delicious umami chicken flavour to all your dishes. Salt, Permitted Flavour Enhancer (E621, E635), Cornstarch, Sugar, Maltodextrin, Palm Fat, Flavourings [(Contains Egg, Wheat), Lactose (Milk Derivative), Canola Seed], Soya Sauce (Contains Wheat) and Spices. All food additives used are from plant and synthetics origins. May contain traces of cereals containing gluten, fish, crustacean, mollusc, peanut and tree nuts. 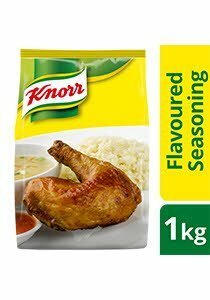 For Stir-Frying, Marinating and Seasoning: Sprinkle desired amount of Knorr Chicken Flavoured Seasoning Powder to improve flavour and taste of foods. For Soup Base: Dissolve 20g (2 heaped tablespoons) of Knorr Chicken Flavoured Seasoning Powder in 1 litre of boiling water.